Someone should let Donald Trump know: there’s more money to be made fixing the world’s problems than preserving the status quo. (And if they turn out not to be problems after all? Boy, we sure invested a lot and made some pretty decent money before we knew everything was going to be okay, and human beings could go back to taking advantage of one another for fun and profit.) 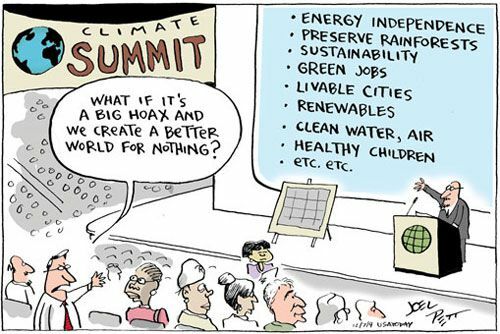 As the classic cartoon says, what if it’s all a big hoax and we create a better world for nothing? Apart from nuclear war (the avoidance of which is also good for business), climate change is not only the greatest challenge humanity has ever faced, but also the greatest opportunity for business the world has ever seen. The most important element of this equation is avoiding the risk of ultimate catastrophe. If climate change reaches a tipping point, it will not only cause loss of biodiversity, refugee migration, food shortages, etc. ; it will also terminate what we think of as the productive economy itself. How many of us would be willing to invest our life savings into a venture that we knew would unavoidably fail? Human beings are not averse to taking risks. But certain catastrophe is not a “manageable risk,” it’s complete disaster, for the economy along with the rest of life and humanity on Earth. In short, it’s not only Trump who needs to complain about “fake news”; it’s actually his buddies who are busy manufacturing it. 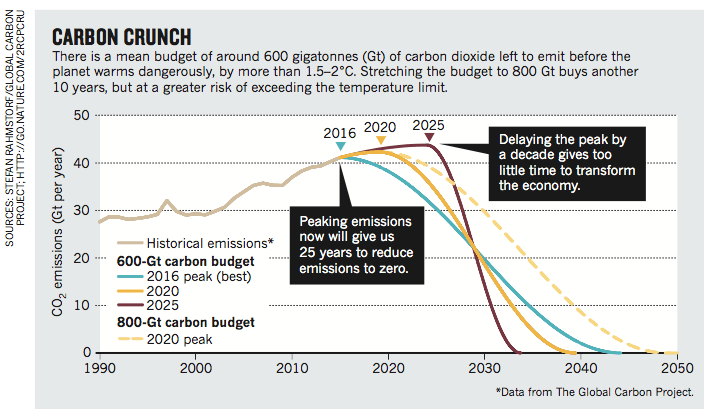 The good news is that it is still possible to meet the Paris temperature goals if emissions begin to fall by 2020 (see ‘Carbon crunch’). …as the UN Secretary General, António Guterres, said in New York last month: “The sustainability train has left the station.” The fossil-free economy is already profitable and creating jobs (www.clean200.org). A report this year by the International Renewable Energy Agency and the IEA shows that efforts to stop climate change could boost the global economy by $19 trillion. The IEA has also said that implementing the Paris agreement will unlock $13.5 trillion or more before 2050. Energy. Renewables make up at least 30% of the world’s electricity supply — up from 23.7% in 2015 (ref. 8). No coal-fired power plants are approved beyond 2020, and all existing ones are being retired. Infrastructure. Cities and states have initiated action plans to fully decarbonize buildings and infrastructures by 2050, with funding of $300 billion annually. Cities are upgrading at least 3% of their building stock to zero- or near-zero emissions structures each year. Transport. Electric vehicles make up at least 15% of new car sales globally, a major increase from the almost 1% market share that battery-powered and plug-in hybrid vehicles now claim. Also required are commitments for a doubling of mass-transit utilization in cities, a 20% increase in fuel efficiencies for heavy-duty vehicles and a 20% decrease in greenhouse-gas emissions from aviation per kilometre travelled. Land. Land-use policies are enacted that reduce forest destruction and shift to reforestation and afforestation efforts. Current net emissions from deforestation and land-use changes form about 12% of the global total. If these can be cut to zero next decade, and afforestation and reforestation can instead be used to create a carbon sink by 2030, it will help to push total net global emissions to zero, while supporting water supplies and other benefits. Sustainable agricultural practices can reduce emissions and increase CO2 sequestration in healthy, well-managed soils. Industry. Heavy industry is developing and publishing plans for increasing efficiencies and cutting emissions, with a goal of halving emissions well before 2050. Carbon-intensive industries — such as iron and steel, cement, chemicals, and oil and gas — currently emit more than one-fifth of the world’s CO2, excluding their electricity and heat demands. Finance. The financial sector has rethought how it deploys capital and is mobilizing at least $1 trillion a year for climate action. Most will come from the private sector. Governments, private banks and lenders such as the World Bank need to issue many more ‘green bonds’ to finance climate-mitigation efforts. This would create an annual market that, by 2020, processes more than 10 times the $81 billion of bonds issued in 2016. Energy: We finance and support clean energy projects, including both energy efficiency and renewables, through PACE, DREEM, and NICCE. Infrastructure: We also finance resiliency projects, and support the improvement of publicly-owned buildings. Land: Our Global 4C policy proposal addresses many of the most important land-use issues, by providing a reward for sequestration and mitigation efforts at all levels. Industry: Our financing structures can support energy efficiency and carbon mitigation improvements in industry. Finance: This is our most important toolbox, because it allows us to make a scalable impact on all of the others. Recent political events have thrown the future of our world into sharp focus. But as before Paris, we must remember that impossible is not a fact, it’s an attitude. It is crucial that success stories are shared. Demonstrating where countries and businesses have over-achieved on their targets will raise the bar for others. More-ambitious targets become easier to set. The new business case for fighting climate change is one of the two major touchstones of our approach. The other is our role as members of the crew of Spaceship Earth.